Those yellow globes were Big Red's eggs-to-be. This has been a rough week so far. I killed a chicken that was still producing eggs. 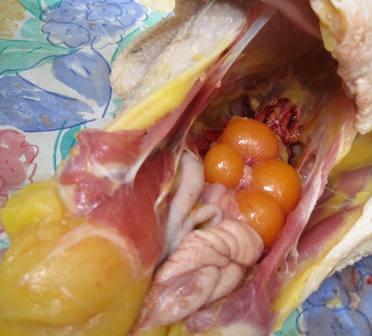 We plucked one egg from her guts, then saw the eggs-to-be at left. It was really fascinating. I butchered Big Red because of her age and what I thought was low production; an unidentified bird has been hatching discolored eggs — I blamed the old dame; and Big Red has had some health issues in the past. So it was off with her head. Then I saw the evidence in her guts and the next day one of the six remaining birds laid a spotted dirty egg — like I attributed to Dead Red. The computer router broke this week. I bought a new one mail-order twice the price of a regular store, then waited five days for delivery. Grrrr. I broke a beautiful pottery bowl ($35 handmade) by dropping a bag of frozen spaghetti sauce on it. Dumb. This morning I tried to add a jacket to a load of laundry on our Whirlpool Duet mid-cycle, and the machine went berserk. I cried. I felt like I broke or killed everything I touched. Bob, my “starter husband” of nearly 30 years said, “The washer is under warranty.” A repair person is coming today. After an hour on the phone with Leo in the Philippines, the new router works. My problems are like a ping pong ball compared to the asteroid-size problems faced by the inmates I visit in prison for Toastmasters. They usually provide me a reality check and realign my outlook. Some days, hormones and problems still get me down. I remember days like this when raising four children — feeling like I was doing and saying the wrong things that would impact them for life. Being a mother is hard. Being a human being is hard. I have to live with my mistakes and guilt, wipe away the tears and keep going.